The heavy-duty range is unified with the medium duty L322 - L328 models. 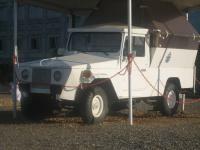 L337 has been introduced in 1959 equipped with 10,8-liters 172 hp engine OM326IV. Maximum speed was 83 km/h. GVW is up to 12 tons. At that time it was one of the most modern german truck. A year later, in 1960, the L337 has been replaced by L338 (GVW is 14 tons, increased engine power) due to mismatch of the GVW to a law. The vehicles were designed for construction works and long haul transportation. Externally it can be distinguished from the medium range by a longer hood. L332 was equipped with a 180 hp engine and has GVW of 14 t. In 1960 it has been replaced by L334B with GVW of 16 tonnes and 192 hp engine. In 1962, L334C model with GVW of 19 tons has been introduced. It was made for export and power of the engine was increased to 200 hp.